I LOVE lime. I love it so much that the lime tree was the first we planted at our new house. I'll take my lime squeezed over buttered and powdered sugar french toast, on top of a shrimp taco, in my water, and my goodness, in dessert? Even better! 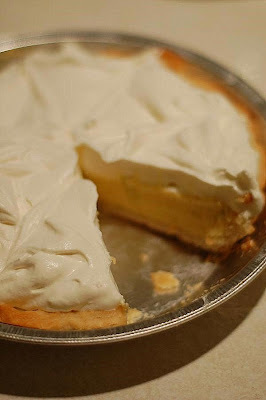 So I was pumped to see the Creamiest Lime Cream Meringue Pie chosen for this week's Tuesdays with Dorie recipe. I spent all day in the kitchen Monday making Greek food (I'll post the Greek Panzanella soon) for my brother's birthday, though, and by the time I went to make the pie I realized I didn't have the four hours necessary for fridge time. 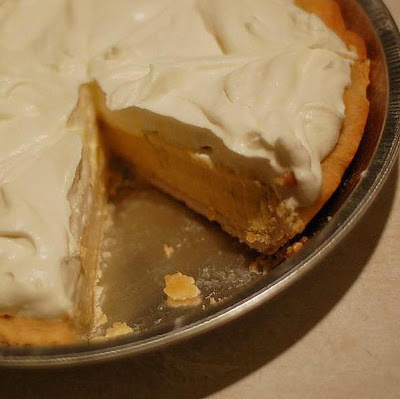 I hated to make gloppy, not-quite-set pie (though let's be honest, I would have been more than happy just to drink the lime cream- it looks so good), so I just opted for my version of the Florida Pie. It's quick, it's easy (so easy I feel almost like Sandra Lee, /gag), and it's a crowd-pleaser. Of course it helps when the crowd is all starving 21 and 22 year old boys (and my little man- he insisted on sitting with "da boys"). While they'll eat anything and everything (they did, too, there's not one scrap of leftovers for tomorrow) this really is a delicious pie. Topped with whipped cream and with all the refreshing lime flavor, this pie's a winner. Note- I used a regular pie crust this time, but a graham comes together in much less time and tastes great too- either way you can't go wrong! Butter a 9-inch springform pan (or pie plate or tart pan). Stir the crumbs and sugar together in a medium bowl. Pour over the melted butter and stir until all of the dry ingredients are uniformly moist. Turn the ingredients into the buttered springform pan and use your fingers to pat an even layer of crumbs along the bottom of the pan and about halfway up the sides. Don't worry if the sides are not perfectly even or if the crumbs reach above or below the midway mark on the sides—this doesn't have to be a precision job. Put the pan in the freezer while you preheat the oven. Center a rack in the oven, preheat the oven to 350°F and place the springform on a baking sheet. Bake for 10 minutes. Set the crust aside to cool on a rack while you make the filling. Working with a stand mixer, preferably fitted with a paddle attachment, or with a hand mixer in a large bowl beat the egg yolks and lime zest at high speed until thick and pale. Reduce the mixer speed to low and beat in the condensed milk. Still on low, add half of the lime juice. When it is incorporated, add the remaining juice, again mixing until it is blended. Bake the pie for 12 minutes. Transfer the pie to a cooling rack and cool for 15 minutes, then freeze the pie for at least 1 hour. Serve with whipped cream and garnish with lime zest or lime wedges. It looks fantastic - I wouldn't have been able to tell the difference for the filling. At least it made it to the pie tin! Perfect meringue - too. They all look like they enjoyed it (as well as the Greek cuisine)! Nicely done!!! What a beautiful pie! It looks delicious! I wish I had a lime tree!!! Oh my dear and oh so talented Anne Strawberry ! My son just said this past weekend how he was dreaming of PIE ! Wooohooo ! Now I have some motivation....thank YOU ! Yum. I would like it like this, too. I started making Dorie's pie, then all the sudden turned it in to ice cream with graham cracker sandwiches! Good! Fun groupies. I LOVE lime, too! I was so glad someone finally chose this one. I loved the meringue but the whipped cream looks good. YOur pie looks great. I love love love lime too. Ooh, I loved the Florida pie. Good call, when you've got a room full of 20-ish year old guys, you gotta do what you gotta do. Your pie looks wonderful! Love the whipped cream on top. I thought I was a lemon dessert girl even though just like you I love a good lime squeezed over my shrimp tacos but this lime meringue pie totally changed my mind. I used a graham crust but I'm hearing raves from the pie crust users so I might have to give that a go next time! So glad you and "the boys" enjoyed your pie! Lime is one of my favorites too! I love it on seafood, as pie and even to grind in my disposal to make my house smell good. It is so fresh. Your pie looks great! i love citrus. now i am craving some key lime pie or something like that. I love lime, and I love your pie! And what a happy looking bunch of guys; they look like they just had one of Anne Strawberry's lime pies - lucky boys! That pie looks gorgeous, but that Greek Panzanella sounds awesome!I can't wait to see it! First off, hat's off to you for cooking for that table of hungry guys...now, that a lot of serious cooking!!! Until this pie, I was just *meh* about lime desserts. It definitely made a lime pie fan out of me. I'm so glad you enjoyed it...your pie looks very tasty! Thanks for baking along with me this week Anne! It looks like a great pie! Yum, yum, ymmmy. Love you! What great smiling faces! Your pie looks and sounds awesome to me. I think it is great when people have their own lime trees. Good call topping this with whipped cream! I think cream > meringue any day! 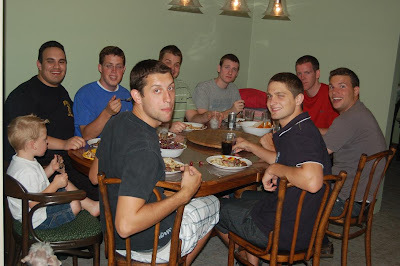 I love your little man at the big boy table! So cute! And your pie too!